Sixty-eight percent of C-suite executives expect organizations to emphasize customer experience over products. Sixty-three percent believe that most organizations will continue to expand their network of business partners. IBM IBV applied cluster analysis to identify distinct segments of organizations among the study participants. Three archetypes emerged: the Reinventors, the Practitioners and the Aspirationals. The organizations clustered within these archetypes are at different stages of their Digital Reinvention. The Reinventors (27 percent of the total) are the market leaders. They outperformed their peers in both revenue growth and profitability over the past three years, and also led with innovation. Their organizations are exceptionally well aligned. Their IT strategy is in sync with their business strategy and they’ve optimized their business processes to support their strategic initiatives. Reinvention never ends. As new opportunities emerge, the organizations that remain open to change can orchestrate advantage. These evolutionary changes include new trusted bonds with customers, new ventures to scale on platforms, and more nimble teams. Remain on high alert and avoid complacency about past successes. Actively scan the business landscape for disruptive change coming from industry incumbents, including those in adjacent industries. Be vigilant about new entrants attracting VC funding that might foreshadow threats. Design and play a new offense. Boldly evaluate, experiment and engage with new business models, industry-shaping platforms and ecosystem strategies that you could adopt to significant advantage. Get ever closer. Create opportunities for frequent and intense interactions with customers, partners and competitors. Test existing assumptions and drive totally new strategies. Divest to invest. Act quickly against the possibility of disruption by adopting a fluid capital reallocation mindset. Frequent capital reallocation from low to high potential opportunities should be an agile exercise. Prioritize advocacy and co-creation over advertising. Maximize investments that build customer trust and brand value. On digital platforms -- which are inherently transparent -- community-generated feedback, if heeded well, can boost brand value in unimaginable ways. Seek innovation over institutionalization. Don’t solidify a competitive advantage; it’s likely fleeting. Expect it to be transitory and start working on the next audacious opportunity. Write new rules. To create a more open and collaborative culture, look for ways to challenge traditional norms. Put a body into orbit around new systems and try it out. Find energy in motion. Create new motion through continuous innovation but don’t dismiss the potential to benefit from others’ ideas. Find opportunities to co-create with customers, partners and even competitors. The World Economic Forum annual meeting is a high-profile gathering that brings together leaders of global society. The heads and members of more than 100 governments, top executives of the 1,000 foremost global companies, and numerous others collaborate at the beginning of each year to define priorities and shape agendas. The theme for Davos-Klosters 2019 is "Globalization 4.0: Shaping a New Architecture in the Age of the Fourth Industrial Revolution." A key component of the international debate will be about how the transformation is introducing technologies at a speed and scale unparalleled in history. Meanwhile, digital business innovation is enabled by access to essential telecom infrastructure. The internet combines thousands of public and private networks from around the world, which together are the key foundation for the Global Networked Economy. And since its inception in 1984, more than 4.7 zettabytes of internet protocol (IP) data traffic have already flowed across it. 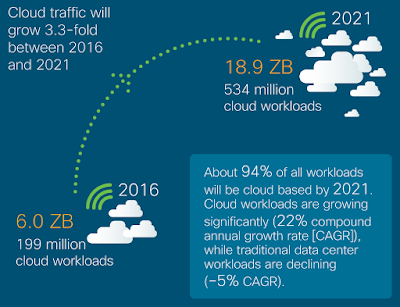 According to the Visual Networking Index (VNI) by Cisco, exponential growth will continue. As an example, by 2022, more IP data traffic will cross global networks than in all prior ‘internet years’ combined up to the end of 2016. Meaning, more IP data traffic will be created in 2022 than in the 32 years since the public internet began. Where will that data traffic come from? All of us, our electronic devices and the way we use the internet. By 2022, 60 percent of the global population will be internet users. More than 28 billion devices and connections will be online. And, video content will make up 82 percent of all IP data traffic. "The size and complexity of the internet continues to grow in ways that many could not have imagined. 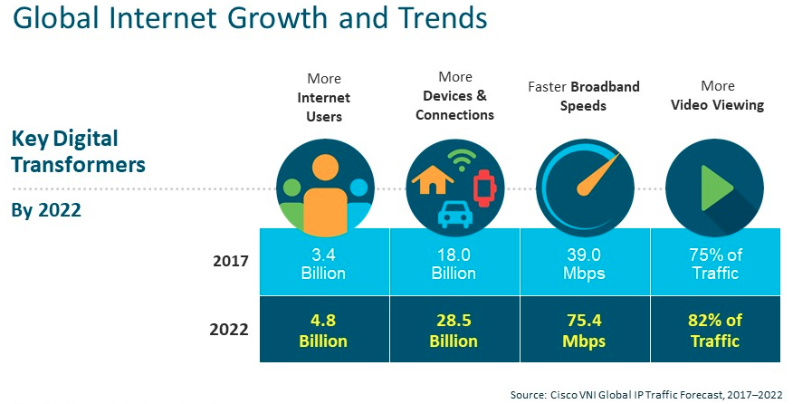 Since we first started the VNI Forecast in 2005, traffic has increased 56-fold, amassing a 36 percent CAGR with more people, devices and applications accessing IP networks," said Jonathan Davidson, senior vice president at Cisco Systems. According to the latest Cisco assessment, global service providers are focused on transforming their networks to better manage and route online data traffic, while delivering premium experiences. By 2022, the busiest hour of internet traffic will be six times more active than the average. Busy hour internet traffic will grow by nearly five times (37 percent CAGR) from 2017 to 2022, reaching 7.2 petabytes per second by 2022. In comparison, average internet traffic will grow by nearly four times (30 percent CAGR) over the same period to reach 1 petabyte by 2022. The Cisco Complete VNI Forecast includes global, regional, and country-level projections and trends associated with fixed and mobile networks. The full report includes additional information and analysis on IoT by industry vertical, IPv6 adoption, traffic growth by application, traffic patterns, cord cutting implications, Wi-Fi hotspots, broadband network performance and network security issues. That said, if you’re one of those Chief Technology Officers (CTO) that previously responded to this scenario by making small incremental adjustments to your IT agenda, then you’re potentially at risk. Any relief from those prior tweaks tend to be short lived. The same issues will likely resurface. Back in 2013, the IBM Institute for Business Value (IBV) introduced the concept of ‘Digital Reinvention’. Why is that concept noteworthy? Markets had evolved from organizational centricity, in which manufacturers and service providers defined a predictable state, into a radically different environment described as the everyone-to-everyone (E2E) economy. The E2E economy has four distinct characteristics, which are now more important since the original IBM study was published. E2E is orchestrated, and based on open ecosystems which are collaborative and inclusive. Orchestration reflects coordination, arrangement and management of complex commercial environments. E2E is symbiotic, where everyone and everything are mutually interdependent. Meaning, collaborative partners engage in co-design, co-creation, co-production, co-marketing, co-distribution and sometimes co-funding. Moreover, the E2E economy is cognitive, characterized by data-enabled learning and predictive capabilities. Emerging technologies are expanding customer influence. A new generation of tech savvy customers demand more sophisticated and tailored experiences. According to a recent global survey of executives focusing on emerging business ecosystems, 54 percent believe customer buying behavior is shifting from a products- and/or services-based to an experience-based approach. Seventy-one percent of global CEOs are now intent on treating customers as individuals rather than market segments -- that’s a 29 percent growth in only two years. And, 81 percent of global CEOs say they want to apply technology to develop stronger customer relationships. What’s changed? Digital Reinvention rethinks customer and partner relationships from a need-, use- or aspiration-first perspective. Digital Reinvention helps organizations create unique, compelling experiences for their customers, partners, employees and other stakeholders. These benefits arise even if fulfillment of the experience involves direct provision of products and services, or orchestration of products or services from partner organizations by way of a business ecosystem. The most successful digitally reinvented businesses establish a platform of engagement for their customers -- acting as enabler, conduit and partner. According to the IBM IBV assessment, to succeed in this disruptive environment, organizations must offer compelling new experiences, establish new focus, build new expertise, devise new ways of working and embrace the digital drivers. Pursue a new focus -- Leading businesses will develop new ways of realizing and monetizing value and spawn new business models, new forms of financing and better, more holistic ways of conducting risk assessments. Leaders will also engage the market in deeper, more compelling ways. They will create strategies and execution plans to deliver deep, contextual, compelling experiences, and find new ways to monetize customer Interactions. Build new expertise -- Leading businesses will digitize products, services and processes that help them redefine the customer experience. They will augment these steps by applying predictive analytics, cognitive computing, the Internet of Things and automation to create a fully integrated, flexible and agile operational environment necessary to support and enable deep experiences. Establish new ways of working -- Leading businesses identify, retain and build the right talent needed to create and sustain a digital organization. The most successful among these take measures to create and perpetuate an innovation-infused culture incorporating design thinking, agile working and fearless experimentation. Leaders contextualize organizational priorities within business ecosystems, seeking new forms of partnering and new ways to build value within overall systems of engagement. They think deeply and strategically about how customer priorities might evolve, seeking opportunities to create engagement platforms to the benefit of their customers, their partners and themselves. Embrace digital drivers -- Leading businesses combine open innovations to create organizations that can build the deep, compelling experiences customers desire. Rather than incrementalism, Digital Reinvention provides a path for visionary organizations to adopt an experience-first approach to planning, employing the strengths of ecosystem partners to create experiences that are truly unique. Digital technologies have redefined how people live, work and play. Pervasive technology is already changing traditional industry structures and economics and is reinterpreting what it means to be a customer and a citizen within the Global Networked Economy. To thrive in a rapidly changing business environment, the most successful organizations will offer compelling new experiences, establish new focus, build new expertise and devise new ways of working -- all based upon a foundation of the latest digital drivers. The fearless market leaders advance this process by embracing Digital Reinvention. They envision possibilities, create pilots, deepen capabilities and orchestrate new ecosystems. Are you open to new ideas, and given a compelling choice are you really prepared to change? That’s what informed CEOs are asking their C-suite leadership team. The context of those questions is about determining who is most qualified to guide the organization’s digital transformation journey. It’s also about setting expectations for C-level executives to partner. IT and business leaders must acknowledge that they’ve likely reached a significant turning point. Business technology advances are disrupting the legacy status quo and bringing huge market turmoil in their wake. Industries are converging, and unfamiliar competitors are surfacing. Granted, that convergence is creating opportunities for growth by shifting from products and services made by solo entities, to new cross-sector customer experiences built via strategic partnerships. But it’s also intensifying market competition. One company’s convergence can become another’s encroachment. So, how do you navigate through this labyrinth? Welcome to the ‘connected economy’ (CE) -- a new business reality in which value is created through technology-enabled links among people, open digital systems and business partner networks. Across industries, huge opportunities are available for savvy organizations to become connected economy leaders. Implementing connected business models and associated processes can help you significantly increase revenue growth and enhance your competitive edge. At the same time, a very real downside to falling behind exists: laggards risk becoming prey to disruptive innovations. It’s a scenario in which a competitor with a completely different business model can put your traditional revenue stream at risk -- or worse, put you out of business. So, with that backdrop, how do you survive and prosper? What does it take to be a leader in the connected economy? IBM asked Harvard Business Review (HBR) Analytic Services to uncover the drivers for business change, assess the preparedness of organizations, and identify the types of adjustments we must make to capitalize on emerging opportunities. Here’s what they found. Whatever their industry, the global CE leaders see their world rapidly changing, and they’re determined to be at the forefront of that change in order to remain relevant and claim their competitive advantage. Their success is increasingly dependent on participation in broader business ecosystems. That being said, even the CE followers and laggards recognize the growing importance of tighter connections with other organizations in adjacent industries. However, CE leaders are radically better positioned within their own business ecosystems -- something that could lead to a long-term advantage. The rest are under pressure to catch up. 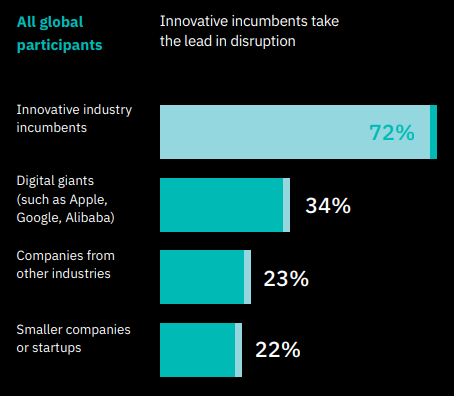 Fifty-two percent say that a substantial part of their revenue is already under threat from digital disruption. To counter that threat, savvy organizations are changing how they operate. Moreover, the progressive CE leaders are already reaping the rewards of their new connected business models. They’ve seen significantly stronger revenue growth over the past two years than their less-connected rivals -- in large part due to their ability to exploit information at speed through their use of hardware, software, and networking technologies. What really sets CE leaders apart is the degree to which they recognize the threat from digital disruption and the value of their IT leadership in bringing them into the connected economy. That awareness is causing them to make digital initiatives a C-level priority. CE leaders have built relationships between CIOs or CTOs and line of business (LoB) leaders, based on collaborative engagement. They invest more in digital technology, skills, and projects. They’ve created digital transition teams, while emphasizing that digital is part of everyone’s job. That being said, only 18 percent of survey respondents say that their organization have applied progressive CE business models or open innovation to a significant extent. A key to success is the ability to exploit information at speed through the use of open hardware, software, and networking technologies. As a result, 48 percent of CE leaders have seen double-digit revenue growth. And three times as many CE leaders claim growth of 30 percent or more, when compared to the laggards. Have C-level executives involved in leading digital initiatives. Dedicate teams to help with various aspects of the transformation. Break down organizational silos through restructuring and fostering cross-functional collaboration. Invest in a data-centric IT infrastructure needed to build their digital platform. Recognize the need for new, more advanced skills, and ensure their teams are acquiring or developing them. 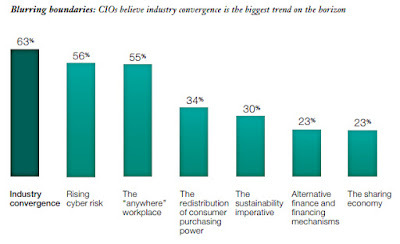 Have a “business innovator” CIO or CTO. HBR believes C-level involvement is crucial, given the profound changes that must take place to transition to a connected-economy business model. In fact, all senior executives at CE leader organizations take an active role in their digital business initiatives. As internal resistance to change is overcome, the connected economy will become even more connected, with success relying on participation in a broader business ecosystem, defined as an interdependent network of collaborative individuals and organizations. More than half of all survey respondents (and three-quarters of CE leaders) said their organization’s success is tied to relationships with organizations in adjacent industries. And, 80 percent of CE leaders are more likely to be favorably positioned within their partner ecosystem. In conclusion, these strategic shifts don’t just happen; they’re led by change agents. CE leaders have made this transition to open innovation a C-level priority. 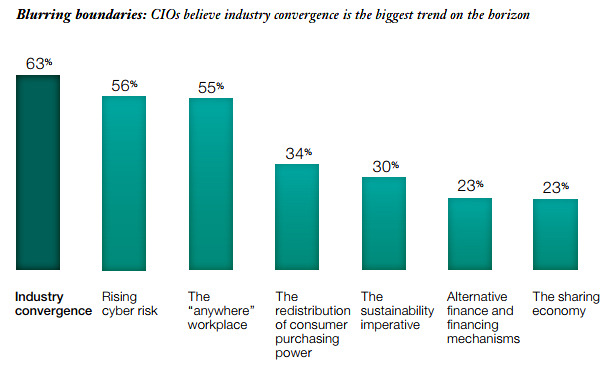 They’re significantly more likely to benefit from business-innovator or transformational CIOs and CTOs who drive cross-functional integration and collaboration between IT and other parts of the business. Not only are they breaking down silos inside their own organizations, they’re connecting to new business partners that apply open technologies in creative ways, as part of a broader digital business transformation model. This is the new normal; leaders adopt open ecosystems. Furthermore, if you believe that a hybrid cloud should support an IT agenda to transform a business, then a viable solution must consider the preexisting systems of record within the enterprise. That’s why forward-thinking CIOs often seek information and guidance on two fronts. First, they want to know how to extract costs from their legacy IT investments. Second, they desire to use that assessment exercise to free-up budget and fund innovation via a DevOps model that would streamline new cloud-native technology deployments. That’s why pragmatic CIOs understand the reality of a coexistence environment, where current on-premises IT systems must be an integral part of the total digital transformation equation. In previous global market studies, senior executive decision makers have stated that they are likely to always have a blend of traditional on-premises IT and cloud-based services. Cloud computing has enabled organizations to increase their overall utilization of existing IT assets. 92 percent of surveyed executives said their most successful cloud initiative enabled creation and support of new business models. Executives said they expect 45 percent of workloads to stay on dedicated, on-premise systems, even as cloud adoption expands. 83 percent of high-performing organizations said their cloud initiatives are coordinated or fully integrated within the organization. According to the latest worldwide market study by IBM Institute for Business Value, there are four main reasons why organizations are strategically combining cloud-based services and traditional IT into tailored hybrid solutions. 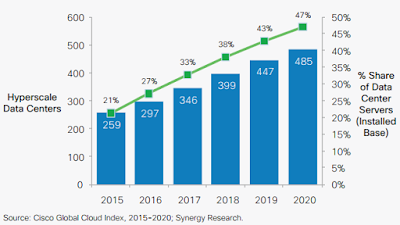 Fifty-four percent of surveyed executives cited the most popular reason for implementing hybrid cloud solutions as lowering the total ownership cost of technology. Forty-two percent of respondents believe that operational efficiencies can stem from selecting the most compatible infrastructure and middleware. Forty-two percent of respondents also said that cloud services are proven to accelerate innovation by enabling quick prototyping of new ideas for faster experimentation. To meet customer expectations, forty percent of respondents reported that cloud’s agile and composable attributes enable faster time to market for new products and services. The optimal Hybrid IT environment will differ by individual enterprise. Case in point; executives say they need to decide which IT and business functions can be delivered through cloud computing with a projectable, positive business outcome. In two years, most organizations plan to use software-as-a-service (SaaS) with a variety of applications. However, many believe that their adoption of cloud could be restrained by three major deployment challenges -- security and compliance requirements; cost structure considerations; and risk of operational disruption. Despite these challenges, successful companies are delivering business value through hybrid cloud in three areas -- operations, finance and innovation. Seventy-six percent of surveyed executives said their most successful cloud initiative has significantly achieved expansion into new industries. Close behind were the creation of new revenue sources and new business models. That being said, fifty-seven percent of executives from high performing organizations identified cost as the most important criterion in deciding which workloads should be moved to the cloud. One way to achieve an optimal hybrid solution is to tap into the capabilities and data that resides on existing systems. The study also found that innovation advantages can be gained by utilizing application programming interfaces (APIs) and by enabling access to external technical talent. Likewise, conducting rapid IT experimentation gives innovative organizations the ability to test and fail quickly. Cloud computing is proven to enable nimble development and testing. What’s more, quick and automated resource provisioning can shorten applications development time. In summary, taking advantage of hybrid cloud services is much easier and more effective when companies rely on skilled and experienced technology partners that provide expertise on recent trends, best practice methodologies and proven hybrid architecture frameworks. You have a choice; you can select the vendor that has all the Hybrid IT components -- technology, products and professional services -- that you will ultimately need to succeed. Choose to deploy an optimal hybrid cloud configuration and gain a strategic competitive advantage that will give you a decisive edge in your industry. Learn how to gain a flexible and secure IT service delivery platform with an optimal hybrid cloud solution that’s designed, engineered and deployed as the best-fit for your particular digital business transformation requirements and technical specifications.